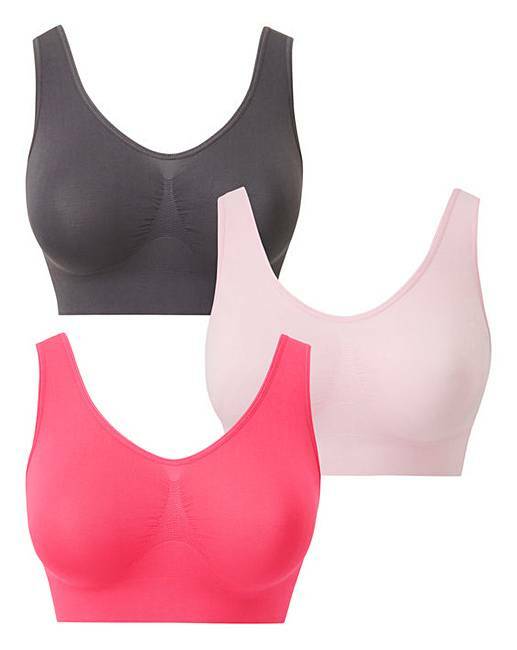 3 Pack Pink Multi Comfort Tops is rated 4.1 out of 5 by 10. Designed using a super-soft, seamless, tubular knitted fabric, these comfort tops from Pretty Secrets provide maximum comfort without compromising on style. Presented in a pack of 3, these tops are perfect for lazy days in the house or during the night as sleep bras. The pullover styling makes these tops super easy to wear, meanwhile the non-padded, non-wired cups and thick straps make for a relaxed feel that lasts throughout the day. To complete the look, why not pair with other garments from our loungewear and nightwear collections? This pack contains 1 pale pink, 1 white and one smoke coloured top. Rated 5 out of 5 by Mazpad from So comfortable I love these comfort tops to sleep in. They are soft yet supportive. This is the second multi pack I have purchased,that says it all. Rated 5 out of 5 by Peeps from Good value I needed some comfort tops so got these, I got the largest size they do as I am of the large breasted wenches. They are a little snug for me but are very comfortable once on. Rated 3 out of 5 by aprilschild from Ordered for yoga Bought for yoga. Very silky. Happy with product for me but would have liked padding. Rated 5 out of 5 by H lea from Awesomd I bought these to wear in bed and they are so comfortable. Rated 4 out of 5 by AnneKR from Nice fit and washes well I was looking for an alternative to Sloggi tops as they no longer go up to my size, so I was very happy to find this three pack. Comfortable, good fit with some support. Useful for night time wear as well as casual daytime. Wish they did a 3 pack of black only or at least a non-white choice for the 3rd colour but that's a small price to pay for true comfort! Rated 1 out of 5 by ksantos from roll up all the time I bought 2 packs of these a week ago, they are that light they offer no support, they roll up at the bottom all the time, i'm only a size 20 but ordered the largest size, so its not because they are too tight. they are ok to sleep in but not wear in the day, wish they still did the racing back ones i bought they were great.